Poster for the Alamogordo Event. 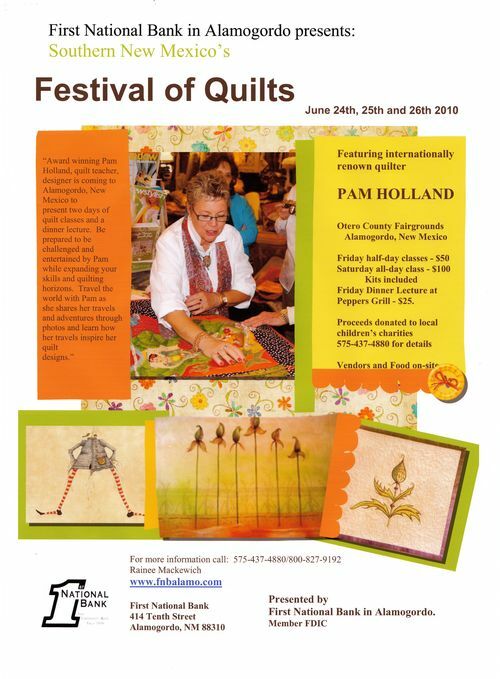 This is the poster we're using for the Southern New Mexico Festival of Quilts. I'm donating my time and all the money raised will go to youth projects in the area. We're having 3 classes over two days and I believe you get a discount for the dinner if you attend the one day class… but then again, you can just come to the dinner. I think it's good value because your class fee includes the kit for most of the requirements for the day. The venue is super and there are lots of vendors selling quilting supplies, old quilts, machines and of course food vendors…. We're going to have fun…. trust me… I'm really excited about the event and it's being managed as a project for the wonderful 1st National Bank in Alamogordo. So come and spend a couple of days with me, it's just a month away and it's going to be fabulous….